Another Happy Day jjimjilbang. I found this one while searching for more resources to add to my previous post, Hongdae - Happy Day Jjimjilbang. 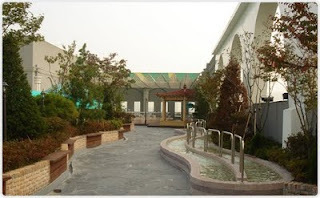 This spa is located near Gu-eui subway station on Line 2. Take exit 4 and turn right at the first large intersection you arrive at (Jayang Sageori / 자양사거리). After walking about 10 min (~800 meters) you pass the Jayang Apartments (자양아파트) on your right, then you'll see the sauna on your left just ahead. 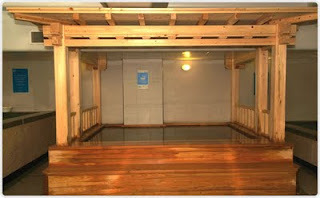 This 7-story sauna looks equally as nice as the one in Hongdae, certainly with greater space and more services to offer. Firstly, it boasts 365 days (which is not unusual for saunas) of excellent services that include fitness and an indoor screen golf system with pose clinic. The basement contains a Chinese medicine tea shop. In the main saunas there are Mediterranean-style mineral water baths, a ginseng tub, steam saunas, and a special hinoki (Japanese cypress) wood bath. I didn't know before that these wood baths have a sterilizing effect on the water - interesting! In the jjimjil area, you can relax in various hot and ice rooms as usual, or enjoy the yellow-soil and charcoal kilns. 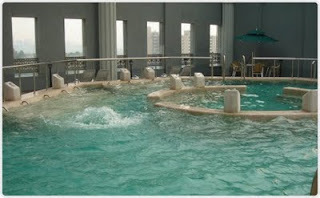 The rooftop is also the site of various aqua-therapy facilities. There is also a 1,000 won deposit for robes.